We laugh every time we see this image. The Sign says it all. "First Class Dance". The groom getting a little wild and crazy about grabbing the garter, and a very shy and embarrassed bride who had an OMG I cant believe whats happening moment all at once. Probably our favorite wild and Crazy dance shot from 5 yrs ago. We still crack up. 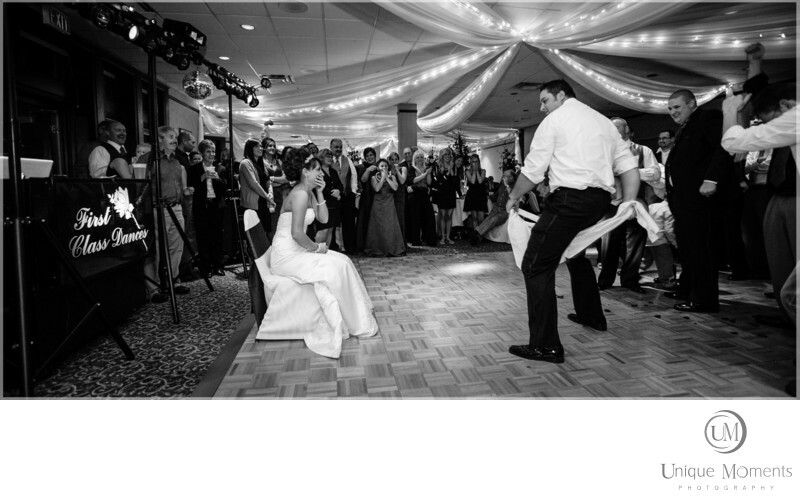 Unique moments Photograph stays until the garter is tossed. We never want to miss fun times like this. We always provide plenty of gotcha shots for the Bride and groom to tease their bridal party with. Weddings are supposed to be fun. This one was off the charts fun.